My grandparent’s clapboard house stood at the end of a dusty lane. Farmland bordered the narrow path leading to the front porch. We passed an empty tobacco barn, silent and still, tucked into the trees as dusty clouds swirled and danced behind our van. The grand entrance to their home magnified the glorious splendor of its simplicity. My parents delivered us that hot summer day to spend some time with our grandparents. Wonder awaited my sister and me there under the oak trees. Our baths would be in metal tubs out in the side yard near the barns after the afternoon sun warmed the water. Food would fill the oval kitchen table for every meal, and we would soon adjust to the lack of television. The front porch swing was my favorite spot. It was there I learned how to raise only one eyebrow and wiggle my nose. Granddaddy and I would sit together on the wooden porch swing he’d built. We’d sway on the creaky suspended seat, and I’d lay my head against his belly. The faded denim of his overalls felt like the finest cotton against my cheek. There was this one moment in the swing with grandaddy where I remember feeling totally and completely safe. As we swayed slowly back on forth, my bare feet dangling over aged wooden planks, I remember wishing I could stay right there forever. I knew the gentle man with his arm wrapped around me really loved me, and only had my good in mind. He was content to sit with me, and I felt my exhale lengthen as the minutes passed. We rested in the swing together with only rhythmic squeaking of metal chains making noise above us. I was reminded of this sweet memory with Grandaddy as I read Danise Jurado’s new book, Fulfilled. In the last part of the book, Danise tells about a hard time in her life. Her heart was broken over losing a loved one, reality was crashing hard and fast, and difficult deadlines were looming. Pain pressed in, pressure was mounting, and there was so much she had to do. There was literally no time to waste. And yet, God tenderly called for her to stop moving, cease every action, and come sit with Him. In the middle of chaos, God whispered for Danise to come to Him and sit still. He often calls for things that make no sense to our fragile minds. So many times smack dab in the middle of rushing around, with serious needs and responsibilities, He calls for us to come and sit. But, Lord, I don’t have time to sit! Come sit down on the porch swing of your heart and lean against Me. The Breath of Life calls for us to pause and take a few deep breaths. If we know His voice, we understand how necessary it is to listen and obey. You will want to grab a copy of her book to read for yourself what God showed her that day. In fact, the whole book is full of lessons from a beautiful soul who loves the Lord and serves Him with her life. Danise Jurado knows the secret to a #fulfilled life is a relationship with Jesus and being filled with His Love. 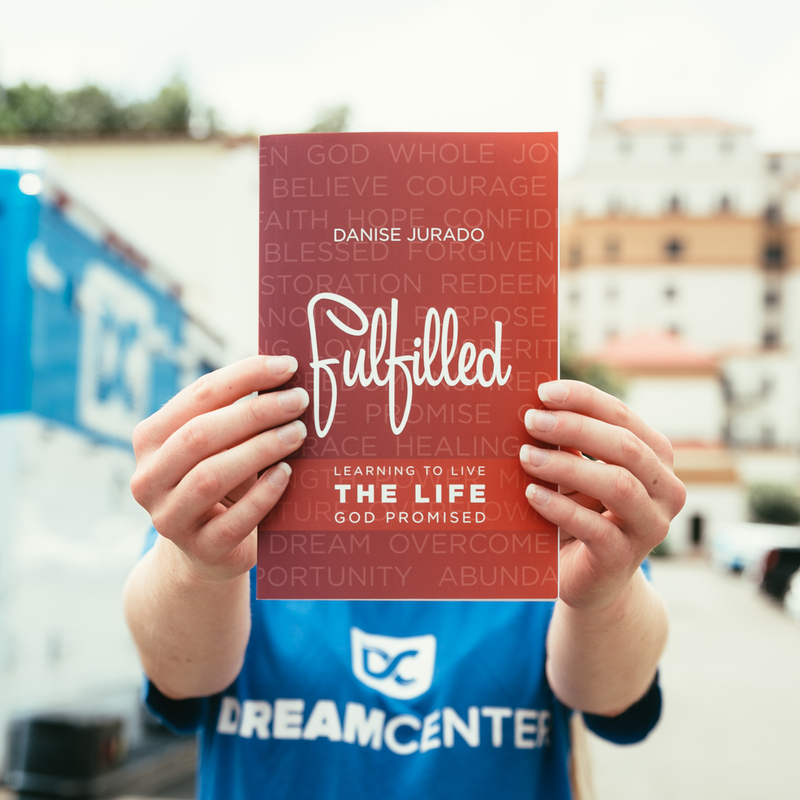 When you order a copy of Danise Jurado’s book #Fulfilled, you will be partnering with her in ministry. She’s graciously donating 50% of her profits to the LA Dream Center where she serves as director. If you’d like a chance to win a free copy of Fulfilled, donated by Danise, simply leave a comment below this post. I will announce a winner on August 25th, the day Fulfilled launches. Putting that title on my reading list. My copy is marked up, highlighted, underlined… It’s a wonderful, encouraging book. I’ve heard so many wonderful things about this book, I can’t wait to read it!! God will use this book in a big way! Would love to read Fulfilled. It’s sad how we let deadlines and daily “craziness” drive how we spend our time! That story reminds me so much of my grandpa when I was a child. I am so blessed to be living on the same property with them out in the country and my children get to have the childhood I was so blessed to have. Grandpa always had the answers I needed, even still to this day. He now has stage 3 lung cancer and I get to return the favor by helping him and grandma like they did so much for me throughout my life. He and I always talk about the Bible. On a different note, I struggle with just sitting still and listening to God. With so much to do, I find myself begging to hear his voice but I never slow do and just have him and I time. Oh, Christine, how blessed you are to still have your grandparents. I am so sorry to hear about your Grandpa’s health. Life certainly makes it difficult to stop and listen. So thankful for a God who is always available. Nothing like the nostalgia of the porch swing and all the memories made there. This sounds like it would be a lovely book to have. I am in a season of life where I am wandering and not knowing what the next step is. Danise’s book sounds like a journey, I could use. Being fulfilled. I’m sorry, Debra. #Fullfilled sounds like a book for you. Thanks for commenting. You are entered in the drawing. God bless.